Weird Scenes Inside the Gold Mine is the Doors' second compilation album (following 13) released in January 1972 and the first following the death of singer Jim Morrison. The album's title is a lyric from the song "The End". The album was released on compact disc for the first time on 19 May 2014 (almost exactly a year after keyboardist Ray Manzarek died). The album was certified Gold by the RIAA. The album cover was designed by Bill Hoffman, with inside band shots by Joel Brodsky. Two of the songs on the compilation, "Who Scared You" and "(You Need Meat) Don't Go No Further," were originally released as B-sides to 1969's "Wishful Sinful" and 1971's "Love Her Madly," respectively. 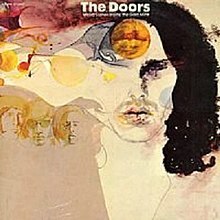 They were not available again until "Who Scared You" appeared in The Doors: Box Set in 1997 and "(You Need Meat) Don't Go No Further" appeared in the 2006 Perception box set. The album was reissued for the first time in over 40 years by Rhino Records, on special amber colored vinyl as part of Record Store Day on 19 April 2014, and as a double CD (for the first time) on 19 May 2014. Robby Krieger – guitar, lead vocal on chorus of "Runnin' Blue"
Ray Manzarek – piano, organ, marimba, bass, lead vocals on "(You Need Meat) Don't Go No Further," backing vocal on "Five To One"
13 - The Doors' first compilation released in 1970. ^ "Record Store Day 2014". Record Store Day 2014. Retrieved 2 April 2014. This page was last edited on 24 February 2019, at 07:19 (UTC).